Old oak planks were used in contrast to the remake of an arched door for this new entry to the garage. What once was a narrow hallway leading to the 30' living room, was broadened using under-lit acrylic, slate walls and tree trunks. Slate was scribed carefully to fit the organic edge of the tree trunks. A hydraulic lift door on tv wall was adorned with walnut blocks to match side walls in both the up and down position. This detail shows the front of the tv wall door and wall face. Opposite the tv wall, is a sitting room complete with mossy carpet and large felt stones to lounge on. Red inserts in curtains complement red walls and cabinets in the room. 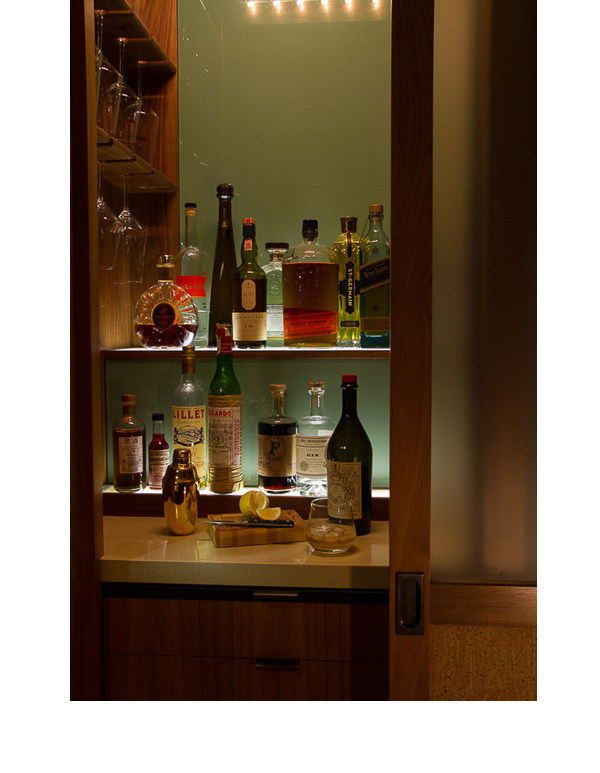 A green glass backdrop was used in this small closet, off the dining area, converted into a bar. The original corner sink allowed for only a view of a column as the focal point. We redesigned it using a free standing counter for admiring the stunning view. Shoji style cabinet doors installed with LED back lighting resulted in a dim subtle light effect, when all other lights in the kitchen were off. Opal metallic tile is made from recycled glass. Quarter sawn ash was used throughout the master bath sink area. The air conditioning vents were incorporated into the platform below the sinks. Tones from the hillside landscape at dusk were used in selecting 15 sizes of 2"tiles. The tub room allows for showering and rinsing in the traditional Japanese tradition. One floor drain allows for the overflow of the bathtub. A careful drawing of all tile placement was followed by the tile setter, who was meticulous in his installation. Open walnut shelving in closets, with access on both sides of the centered bed, allowed for two individual interior designs. Crooked style shoji panels were made to hide roof from bed view. Mr. Fong is a minimalist tech aficionado. He wanted little to no fuss, requisition touch keypads for controls and no bookshelves or much furniture. His wife has pet bunnies and stuffed animals and a studio full of craft and photography equipment. She grew up in natural environments. To marry their two styles together, was a challenge and pleasure. The architecture was simple and non-descript when we approached the house. Opening the entrance hall in width from a balcony railing to first floor, allowed for expanding the hall and the insert of an under-lit floor. The large atrium opened into a thirty foot long living area where moss colored carpet, felt stone furnishings, slate walls and stripped tree trunks, hinted to the organic nature from the outdoors into the modern setting. The colors in the hills outside the Japanese bath window inspired the used of many colored tiles in cubist grass-like forms. The combination of recycled barn wood as a pantry door and bamboo-walnut cabinet doors in the kitchen, lended to an eclectic look in a wide floor plan. The table and benches in the adjacent room slide into the kitchen area for family dining. The media center consists of a hydraulic walnut block door that was matched in design to the exterior wall, closed and open, allowing for the media to be hidden from view when desired.